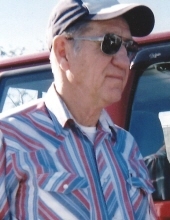 Charles L. Graf, 84 of Keokuk, IA died Friday, April 5, 2019 at River Hills Village in Keokuk. He was born August 24, 1934 in Keokuk, IA, the son of Charles Ottogaret and Nellie Elizabeth Krueger Graf. He graduated from Wayland High School in Wayland, MO. Charles was a veteran of the United States Army. On September 29, 1959, Charles was united in marriage to Sara Brookhart. She preceded him in death on September 19, 2018. Charles had been a farmer on the family farm and he and his dad also owned a saw mill in Alexandria, MO. He later worked at Fruehauf in Ft. Madison and was a driver for Truck Transport. After his retirement he worked as a night watchman at Midwest Academy in Keokuk. He was a member of New Testament Christian Church. Charles loved going on walks and riding his bike. He was a talented woodworker and made many wood signs and stands. Charles and his wife Sara enjoyed spending winters in Arizona. His dog Corky was his best friend and faithful companion. He is survived by one sister, Imogene Brookhart of Newton, IA and several nieces and nephews. He was also preceded in death by his parents, his stepmother, one brother and two sisters. A graveside service with military rites was held at 1 p.m., Tuesday, April 9, at the Hickory Grove Cemetery in rural Keokuk with Dawn Farris officiating. "Email Address" would like to share the life celebration of Charles L. Graf. Click on the "link" to go to share a favorite memory or leave a condolence message for the family.